The historic spacewalk has been canceled. Astronaut Kathy Sullivan poses for a picture with her space suit during a 1995 shuttle mission. Sullivan was the first American woman to go on a spacewalk. 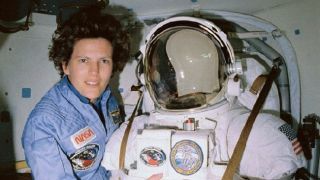 But that moment, which by coincidence would have occured during Women's History Month, evaporated Monday (March 25) when NASA announced that the lack of enough properly sized spacesuits would prevent astronauts Anne McClain and Christina Koch from venturing outside together. The disappointing news came after weeks of anticipation for the spaceflight milestone that could have been. After conducting her first spacewalk last week in a large-size spacesuit, McClain realized that the suit didn't allow her to maneuver comfortably or effectively. During the spacewalk, she found that she would need a medium-size upper torso for future work outside the International Space Station. While there are two medium-size suits aboard the space station, only one has been prepped for a spacewalk, and it would take extensive crew time to prep the other suit. So, instead of assigning those extra hours, Nick Hague will go in McClain's place with Koch for the spacewalk. And, while the comfort and safety of the astronauts remains the most important aspect of any space mission, this last-minute reassignment seems to highlight the reality that many women will have to overcome additional career roadblocks working in a world designed to accommodate men. NASA astronaut Anne McClain waves while performing a spacewalk on March 22, 2019. Because of a lack of properly fitting and prepared spacesuits, McClain will not participate in the next spacewalk this upcoming Friday (March 29). Before NASA's announcement, we spoke with former NASA astronaut Kathy Sullivan, the first American woman to go on a spacewalk, about the potential of that historic moment. Almost 35 years ago, in On Oct. 11, 1984, Sullivan took her first steps in space. The history in these steps was far from her mind as she focused on her mission in which she operated a system that showed that a satellite could be refueled while in orbit. Her spacewalk came just months after cosmonaut Svetlana Savitskaya became the world's first female spacewalker on July 25 of the same year. "Gee, if you ever hoped to do another spacewalk, it would pay to do the first one really well," Sullivan said about her focus on the mission. While the world focused on the historical significance of her work, Sullivan was just there to do her job and do it well. But women at NASA, like women working in most professions, typically encounter more obstacles than their male counterparts. Thankfully, Sullivan told Space.com, she'd only had one or two rude comments about her gender during her time as an astronaut, perhaps because "walking into NASA with the title astronaut would be a little like walking into the Navy with the title admiral instead of cadet." In other words, once you earn the title of astronaut, people are less likely to give you a hard time. But, while Sullivan reported little to no harassment, the women she knew working to become flight controllers, flight directors and astronauts "had to do a whole lot more and deliver a whole lot more a whole lot better before they would get the advancement or promotion that lots of times, a man would have gotten on the first good thing." Sullivan added that she would see women, for example, working on a program with someone as a deputy, turn the program around, solve a budget problem, and get the program back on track. "A young guy who did that would probably get catapulted into project manager the very next go," Sullivan said. "As the woman did that as a deputy, she was lateralled into being somebody else's deputy … she didn't get the reward as the added stature and advancement, she got another opportunity to clean up." Kathy Sullivan and Dave Leestma work on the orbital refueling experiment during a spacewalk. But, as McCain and Koch's position shows, even once a woman has climbed that ladder and proven herself beyond a shadow of a doubt, there are still hurdles. As Sullivan told it, this was not the first time that an all-female crew for a spacewalk has been discussed. Years ago, she said, NASA considered arranging an all-female spacewalk on purpose. But the women in the astronaut corps themselves were opposed to the idea, because it would have been orchestrated as a "stunt," that would serve only to further tokenize them in the industry. "We're not here as tokens and toys to play around and make games of," Sullivan said. But, "what really gives me the greatest satisfaction," Sullivan said, about the now-canceled spacewalk, is that "it isn't a stunt, [it's a] consequence of there being enough women now in the astronaut ranks, now in the flight ranks, now serving as flight directors. That, in the normal course of assignment rotations, you can end up with more than one woman involved in some high-stakes event." "There will be multiple women in multiple key roles … I would argue there always have been, but they have now made their way to the front line. To the front console, to the EVA [spacewalk], to the flight director's chair," Sullivan added. The spacewalk scheduled for this Friday would have been a triumph. It was not a scheduled stunt. It was, as Sullivan described, the natural consequence of more women rising up the ranks and being recognized for their work. The next chance at this setup may not happen anytime soon; only 13 of the 223 astronauts who have walked in space have been women. Still, the likelihood of an all-female spacewalk will continue to increase as more and more women become astronauts and participate in spacewalks. Perhaps this missed milestone will be a lesson for NASA to have the proper equipment prepared for crews of all shapes and sizes — something that is already important as human proportions often change as the spine lengthens slightly in microgravity. "Be sure you give yourself those couple of moments outside to really absorb where you are … grab those moments and write them vividly into your brain because they're the moments you'll treasure from the spacewalk long afterward," she said to the crew.